Perini Navi successfully completed the first trial sail of the 88m Clipper Yacht the Maltese Falcon last Wednesday in an 8-16knt offshore breeze on the Bosphorus sea. 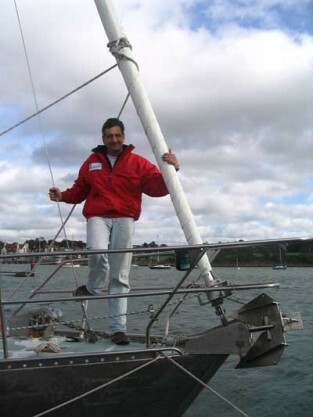 Tom Perkins the owner, who acted as project manager during both project conception and construction of his vessel, commenting on the first sail said: “The Maltese Falcon has written a new page in the history of yachting, the DynaRig is no longer an experimental concept. Everything worked as engineered and the yacht achieved some remarkable numbers: hard on the wind in 15.8 knots true, at 38 degrees relative wind angle, we sailed with no fuss or strain at 10.5 knots. On a close reach at 60 degrees relative angle, the speed (still at knots 16 true wind) climbed to 14 knots. The balance is, essentially, perfect – with weather helm never exceeding 0.6 degrees on the wind, or 2.5 degrees on a fast reach. The engine trials were also a great success: the specification called for 18 knots, but she achieved nearly 20 (19.6) knots, with minimal wave making and virtually no vibration with a smooth and non-turbulent wake. At full power the two 1,800hp Deutz engines – which turn at only 1,800rpm – made almost no noise; so little that the sound from the air-conditioning in the aft cabins was louder than the sound from the engines. The Maltese Falcon’s design and construction has been a collaboration between Perini Navi, Ken Freivokh, and Dijkstra & Partners. Her three carbonfibre masts, manufactured and assembled at the Yildiz Gemi yard in Tuzla under the supervision of the English company Insensys are free-standing and rotating, an absolute world-first for an application of this size and complexity. Based on the DynaRig square rig concept – developed with Gerry Dijkstra & Partners of Holland, each mast carries five separate square sails supplied by Doyle Sails. The Maltese Falcon’s stunning interior was designed by Ken Freivokh and supplied by German based Sinnex. Her accommodations can be configured from four to six stateroom suites. The Maltese Falcon is expected to sail in the Mediterranean early this summer. MCA Commercial Certified and ABS __A1 Yachting Classification.